8-person tents have become more popular among campers. 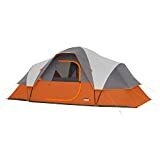 Among families and those who like to camp with a lot of friends, these tents provide a lot of room, so everyone is more comfortable. These tents also come with a lot of storage options for your equipment. But how do you figure out which tent is the right one? Not all these products are made the same way, so we reviewed the top 10 eight-person tents. We have included as much practical information as possible so you’ll know what each one can provide for you. 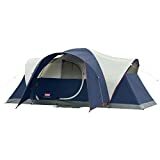 AmazonBasics is a spacious tent designed for 8 persons to comfortably fit in. Measuring 15 x 9 feet (L x W), there’s enough space here to for people and camping gear alike. 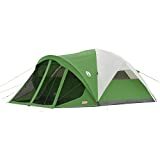 It’s ideal for family camping and for those who carry a lot of gear. The tent also scores points for being easy to set up. Instructions are detailed and easy to follow so you will be ready in no time. The corded shock poles are included as well as the stakes and poles. The tent also comes with a variable venting system and cool air-port so you can tweak the airflow. The polyester fabric can withstand heavy duty use, and the rainfly does an excellent job of keeping the tent dry. Its venting system is one of the most durable in its range, providing long-term benefits. The Coleman Elite Tent is made from polyester taffeta 75D flysheet, one of the best materials for tents. It also comes with a revamped dome design with color poles and pole sleeves for easy identification and set up. The Coleman Elite has a hinged door, so it is more convenient to enter and exit the tent. If there are 8 people in the tent, an easy entry and exit point is a must. A 3 setting LED light (highlight, low, high) is provided as well as step by step instructions. The Elite is 16 ft x 7 ft when assembled. The center is over 6 feet high, so there’s room to stand. The floor space is large enough for 8 people, and its seams are leak free. The fabric is also weather resistant. The Core 9 has space for 8 to 9 persons and has H20 Block Technology to keep water at bay. The window and door seals are rain resistant, and the rainfly is fully taped. The sealed seams also add to the durability. All the Core 9 fabrics are water-repellent, and the mesh ceiling draws hot air out. The air intake is adjustable and replaces the hot air with cool air. The 6 ft center ceiling is nice, and the 16 x 9’ floor plan is more than adequate. The tent walls have interior pockets, and there is also a gear loft where you can place various items. 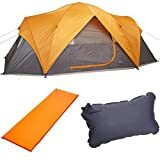 While the tent has space for 9 people, you can instead put 2-3 queen sized beds in it. Either way, there is a lot of space here. Is an 8 person tent not enough for you? 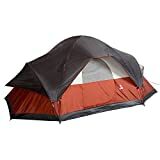 In that case, the Core 9 person tent may be what you are looking for. You get a carry bag for the tent, rainfly, and stakes so you can pack up when you are done. The Core includes an electrical cord access port which can be closed if you’re not going to use it. A room divider gives the occupants privacy, great if you’re camping with family or friends. The tent’s storage pockets allow you to store small items, so they don’t clutter the floor. It also has Core H20 Block Technology, so water runs off faster. The rainfly is also taped for durability, but you can also remove it during summer. With a 14 x 9 floor space, there is lots of room for 9 people or 2 air beds. The Tenaya is built for 8 individuals or three air beds, and one of the most notable features of the tent is the integrated closet. The closet measures 2 x 2 feet, large enough for your stuff but doesn’t take up a lot of space in the 15 x 9 ft tent. The tent has inverted seams and welded floors that keep the interior from getting wet. If you’re camping with friends and family, you can use the divider for privacy. Its Fast Pitch design lives up to its name as it takes less than 10 minutes to set up. For many campers, the integrated closet is the biggest attraction. It comes with a hanger bar and shelves so you can keep your stuff organized. 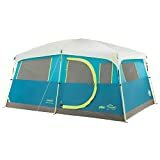 When it comes to durability, the Coleman Tenaya more than holds its own compared to other, more expensive tents. Lastly, a carry bag is provided so you’ll be able to pack it in when you’re done camping. The Klondike is available in two colors, blue and gray. Both are built for family camping and for those who like to camp with friends. The tent is 16 x 11’ and has sleeping room for up to 8 people. 5 persons can comfortably fit in the 98 ft main interior, and 3 more persons fit in the screen room (60 sq ft). The spacious interior is matched by the 6 1/2 ft headroom. The tent walls zip up smoothly but give you lots of room to stand up and move. The two mesh windows and mesh roof keep the bugs away but allow fresh air to get in. The screen room is also versatile enough to be used as a gear storage room, a picnic area or sun shelter. The tent is made from Weather Armor and keeps the interior dry. The Evanston is made from durable polyester so it can withstand a good deal of rain and wind. Clear cut instructions are provided so even a new camper will have an easy time assembling it. Measuring 15 x 12 feet, the Evanston takes 15 minutes or less to set up. The middle of the tent is 6 feet high. With those dimensions, you’ve got enough room for a couple of queens sized air beds or 8 people sleeping on the floor. The screened room is a good place to relax, and the inverted seams and welded floors are among the most durable in the Coleman line. As for durability and performance, the Evanston handles 30 mph winds and lots of rain. The roomy interior, durable fabric, and easy setup make the Evanston an excellent choice for family campers. It is also for those who prefer a durable tent. 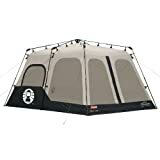 The Montana 8 person tent takes 15 minutes or less to set up. Once you’ve got it down, the tent is 16 x 7 feet with a center height of 6’2”. When you’re done camping just put everything in the carry bag. Montana has a hinged door, so everyone inside gets in and out quickly without trampling over each other. The extended door awning keeps your camp gear dry. By leaving your shoes there, they won’t get soaked either. The tent has the WeatherTec system, so it keeps you dry even if it rains outside. Strong support also keeps the tent stable even if there is some wind outside. Stakes are also included, so you don’t need to buy anymore. Montana is available in three colors, green, blue and black. The colors are the only difference as the build quality is the same. The Coleman Instant Tent deserves the name as setup takes just 3 steps and less than a minute. The assembled tent center is 6’7”, higher than most tents. At 14 x 10 feet L x W, there is room for 8 people or two queens sized air mattresses. The Instant Tent has constructed from Polyguard 2x fabric. This fabric is thicker than those used by other tents. However, in spite of this, the Instant Tent is properly ventilated, so everyone inside is cool. The WeatherTec system is well implemented, keeping the floor and the rest of the tent interior dry. All the windows can be zipped up nicely without making any noise. 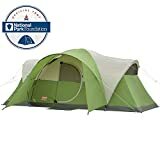 A single person can set this tent up, and it will be even faster if you’re with another person. A carry bag is also provided. Measuring 17 x 10 feet, the Red Canyon is built for 8 people, 3 queen mattresses or for campers who carry lots of gear. All the required stakes and poles are packed in separate bags for your convenience. 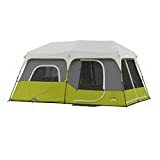 The middle of the tent is 6 ft high which is typical of these models. The WeatherTec system keeps the fabric water repellent, and the combination of the inverted seams and welded floors ensure the interior does not get wet. The interior is big enough for three rooms, and the inclusion of dividers is convenient. A rainfly is provided, so you don’t have to buy an extra. The setup is straightforward, and a single, experienced camper can do it. The zippers are well made and don’t produce noise the way other tent zippers do. Performance wise the Red Canyon holds up well against rain and wind. Compared to other camping tents, the Red Canyon is well suited for those who like to camp out a lot. If your tent is getting crowded, then maybe it is time you upgraded to 8-person tents. Even if you’re not planning to bring along 7 friends along, the extra space comes in handy for your camping equipment.